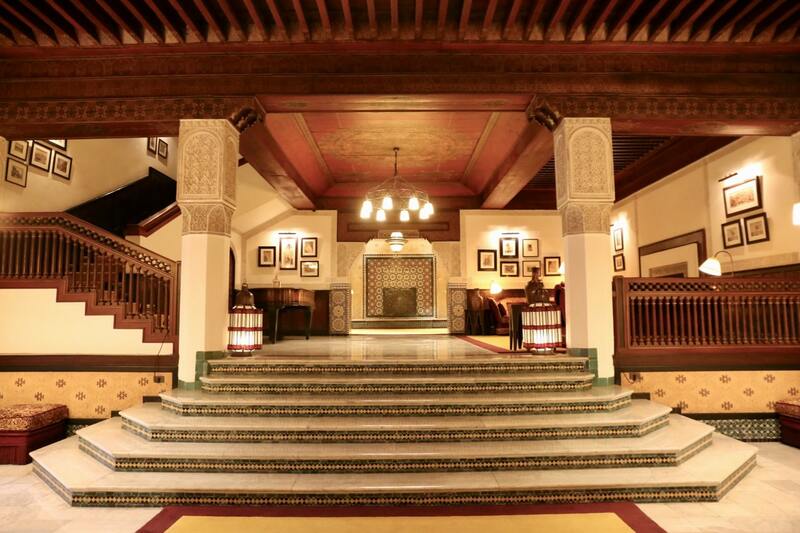 The original hotel was designed by Henri Prost and Antoine Marchisio, who achieved a pleasing mix of Art Deco and Moorish styles. In recent years the hotel underwent a massive renovation by famed French architect, Jacques Garcia, and re-opened in 2009. 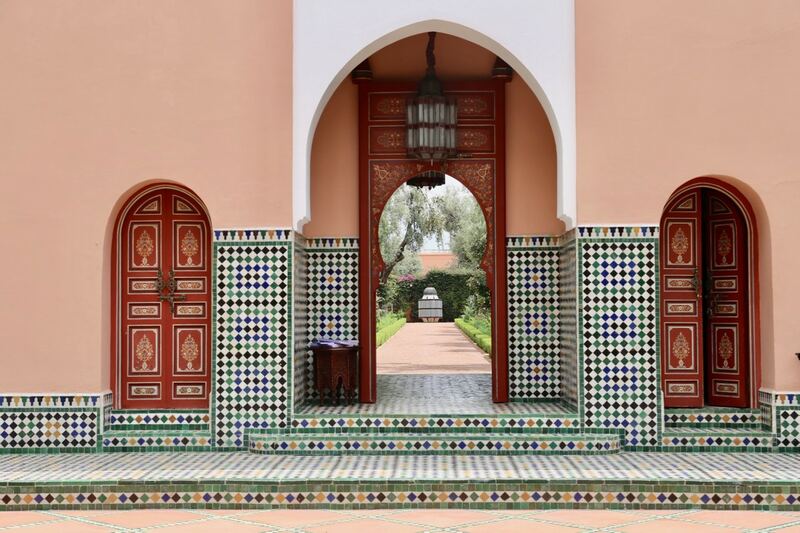 Garcia wanted to return the magic and mythical nature to La Mamounia in the reconstruction, while adding modern touches alongside traditional Moroccan design. 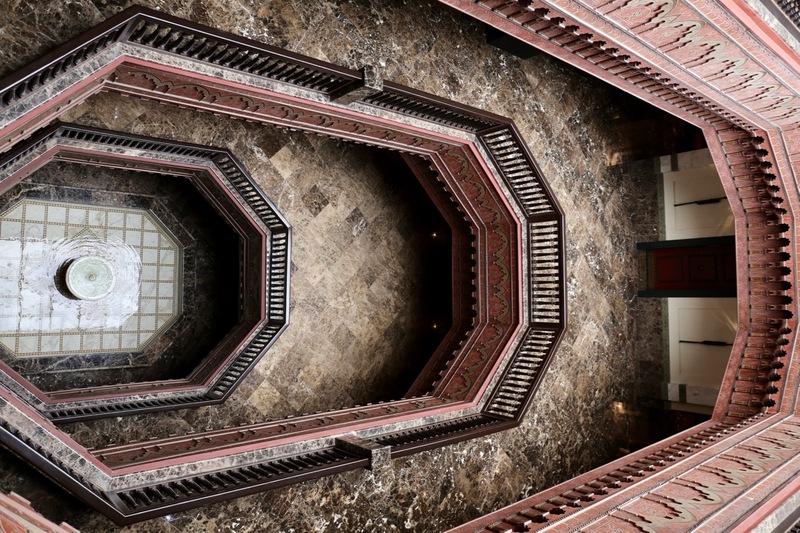 During the three year, $180 million-dollar renovation, Garcia worked with thousands of local craftsmen who created the mosaics, hand-carved and painted ceilings, crafted tile, and engraved plaster, which can be found throughout the resort. Many famous people have loitered in luxury at the La Mamounia, including Winston Churchill, Charlie Chaplin, Francis Ford Coppola, Martin Scorsese, Nicole Kidman, Susan Sarandon, Kate Winslet, Catherine Deneuve, The Rolling Stones, Yves Saint Laurent, Gwyneth Paltrow, Jennifer Aniston, Juliette Binoche, Orlando Bloom, and Andrea Boccelli. 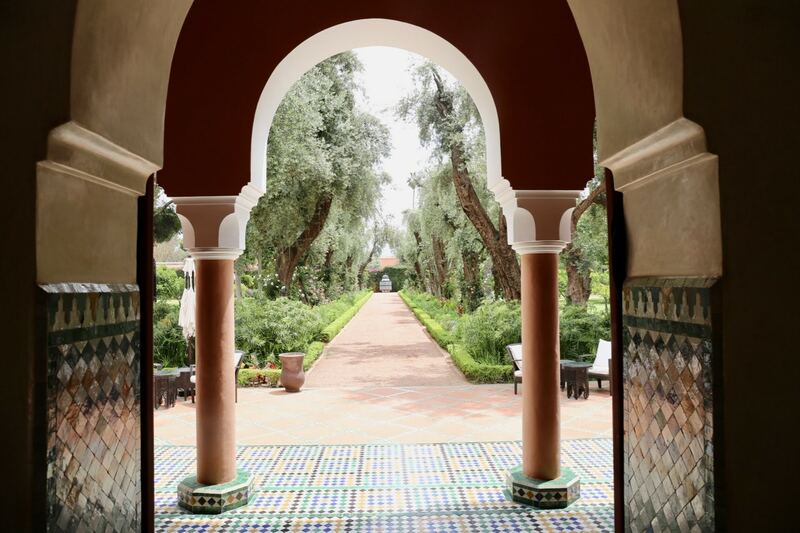 With the hotel’s impressive list of VIPs, it’s no wonder that La Mamounia was ranked as the Top Hotel in the World via 2018 Conde Nast Traveler’s Gold List. 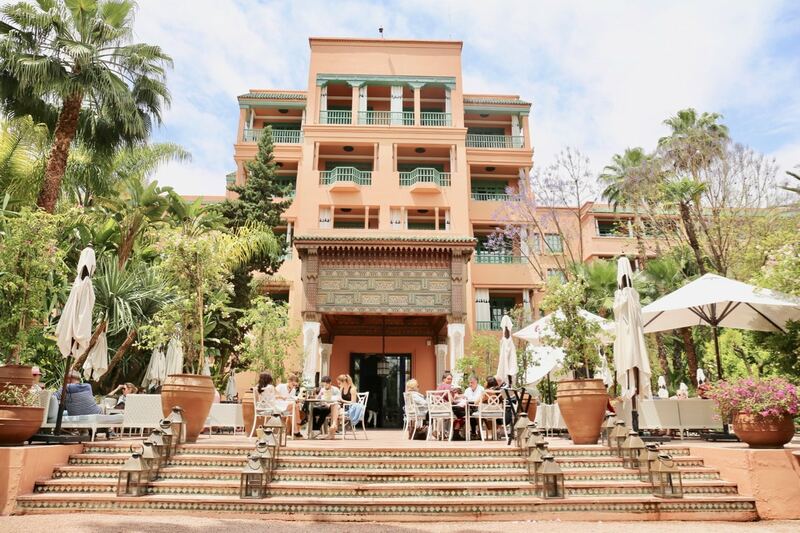 Wander around the property and you’ll find fashion boutiques by Dior and YSL, a famous French pastry shop filled with a rainbow of macarons, a serine spa, massive outdoor pool, and trilogy of fine dining restaurants serving elevated fare inspired by kitchens in Morocco, France and Italy. 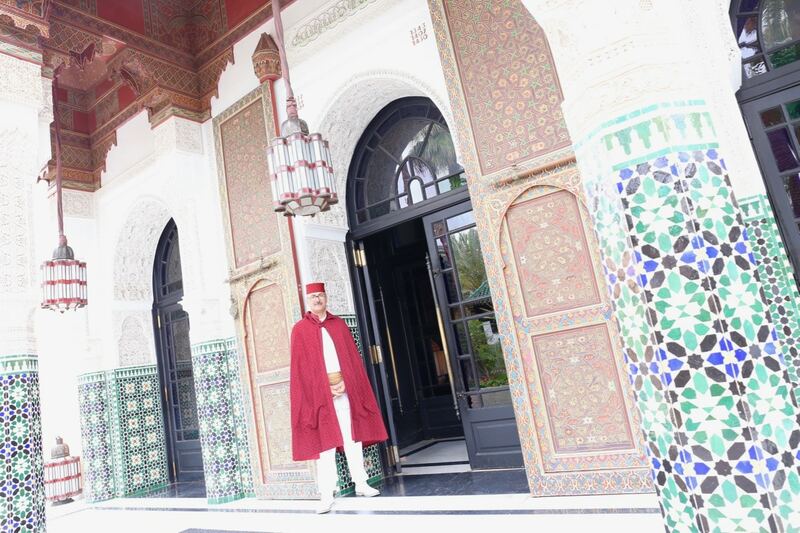 Guests are greeted at the hotel’s front entrance by dapper doormen who wear eye-catching rich rouge capes. 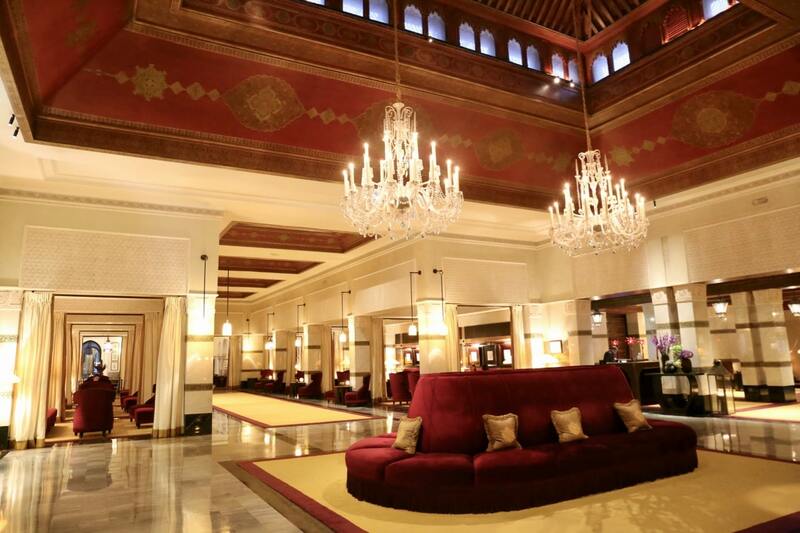 Behind the hotel’s iconic entry gate and beyond its majestic wooden doors lies one of La Mamounia’s many gems: the lobby. 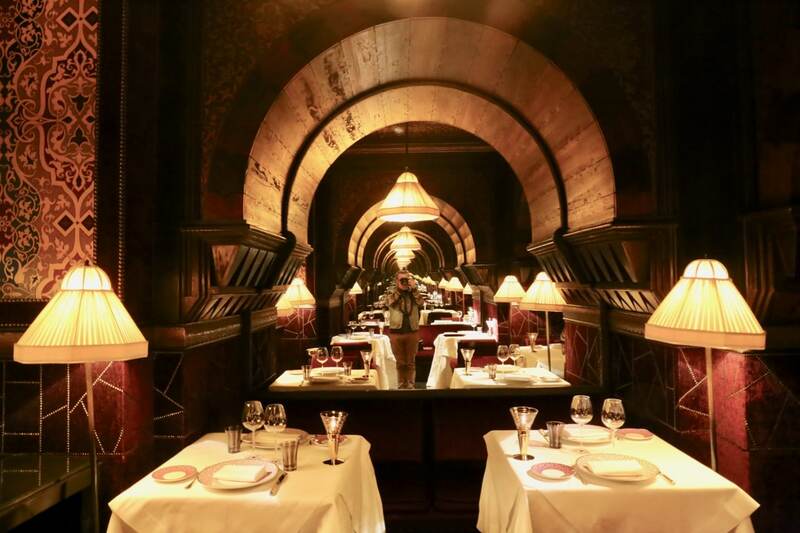 By harnessing the mood of a palace and the power of traditional Moorish architecture and craftsmanship, world-renowned interior designer, Jacques Garcia has created an oasis in the heart of a culturally vibrant and bustling city. 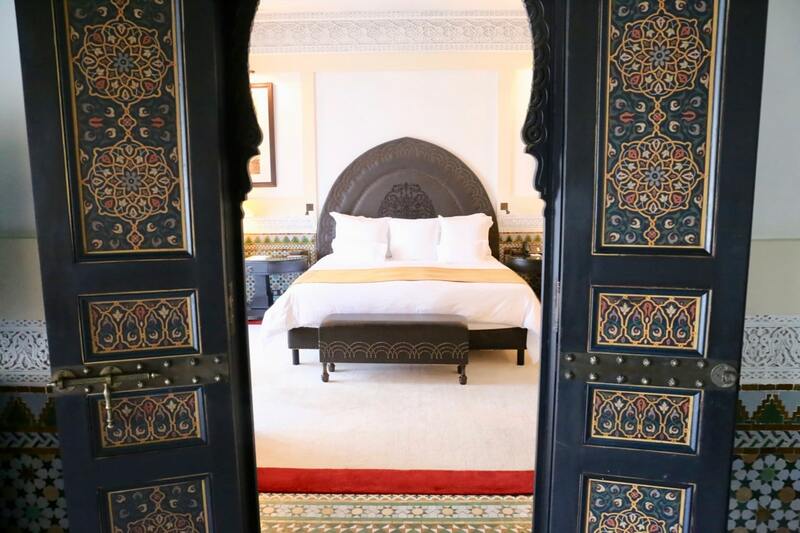 Once inside, one’s senses are subtly seduced by the essence of cedar and dates (La Mamounia’s signature scent), while Baccarat crystal chandeliers hanging from a hand-painted, wooden ceiling and traditional Moroccan lanterns illuminate the room. Marble columns, topped with artisan-carved plaster adornments divide the lobby in various seating areas lined with dramatic fabrics and plush furnishings, providing an attractive space in which to linger. 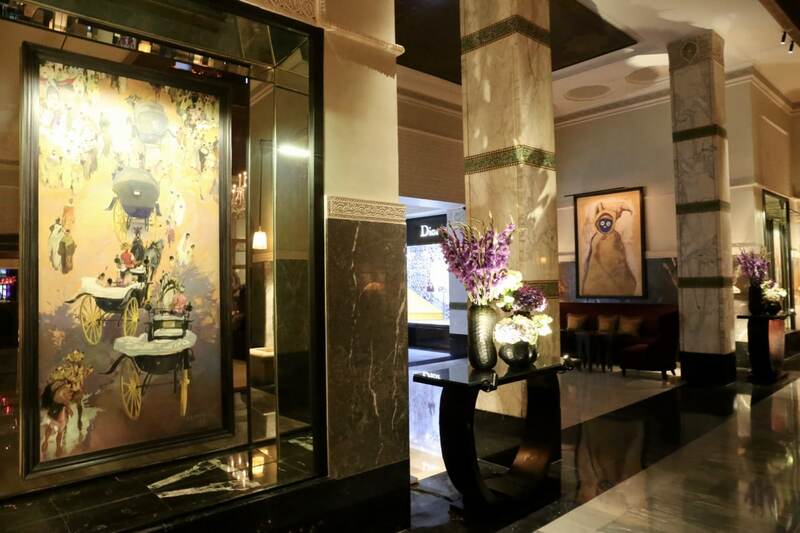 The space is decorated with inspiring artworks that depict energetic street scenes in Marrakech alongside vase’s filled with fresh flowers. 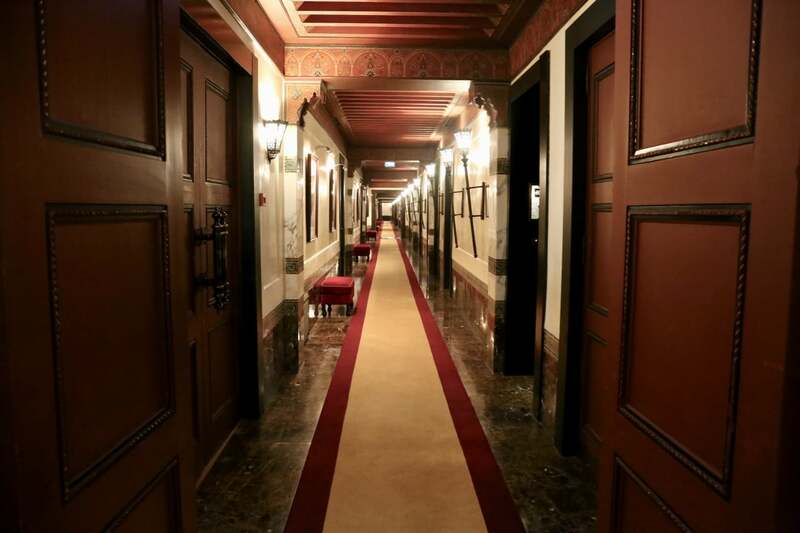 A view of the hallway leading to my suite. Indulge in those fine design lines. 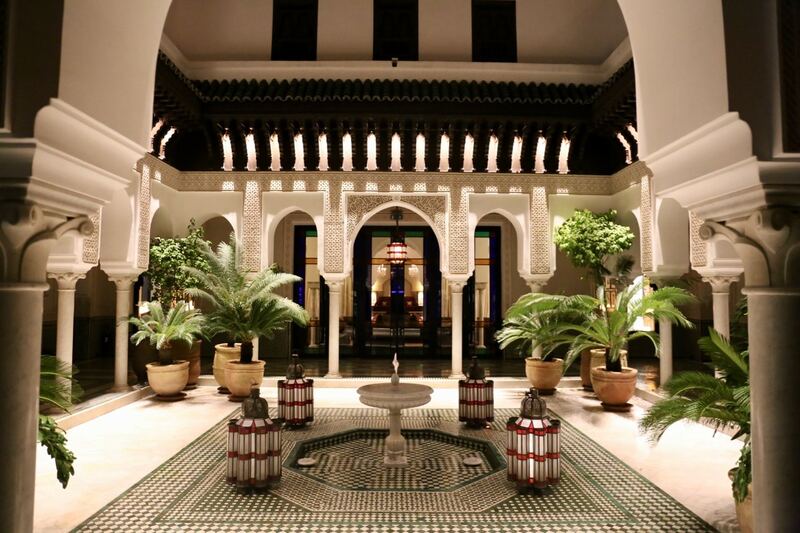 Everywhere you turn at the La Mamounia there are thoughtfully designed inspirations. This photo was taken looking down from the 4th floor at a frothing water fountain (one of 27 fountains found at the hotel). The Agdal Park Suite offers a wonderful view of the swimming pool, the legendary gardens and the Atlas Mountains, invoking a sensation of grandeur. 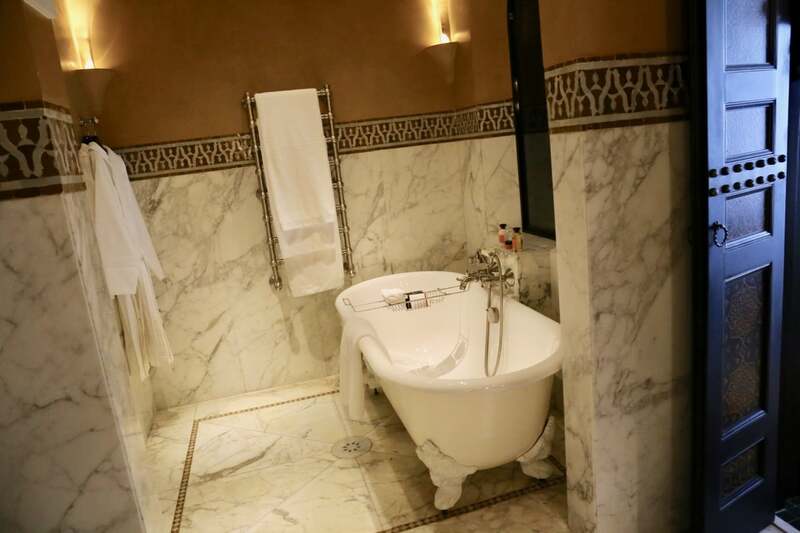 Marble bathrooms offer soothing mood lighting and are all completed with a Moroccan style walk in shower. Indulge in the hotel’s signature scent via bathe amenities crafted by French perfumer, Olivia Giacobetti. The aroma is a combination of citrus elements and woody notes of Atlas cedar. Step outside of the spacious suite and you’ll find a sprawling balcony featuring two chairs and comfy loungers which offer views overlooking the hotel’s pool. Hidden within the walls of the legendary 17-acre royal gardens, La Mamounia offers its 7,500 square foot outdoor swimming pool as an intimate, Mediterranean oasis. While rejuvenating poolside in the Moroccan sun, guests find serenity underneath a canopy surrounded by 700-year old olive trees, amaranth agaves, and periwinkle of Madagascar. The water in the pool is treated with non-irritating ozone instead of chlorine, imparting a fresh post-rainstorm smell throughout the pool gardens and nearby grounds. 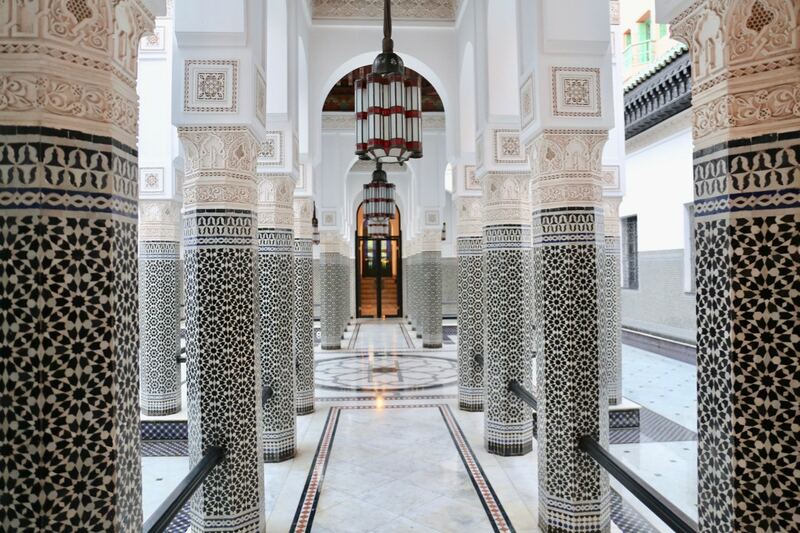 These eye-catching columns can be found in a courtyard just off of the hotel’s main lobby. The space fills with natural light and is a popular spot for wedding couples to have their photographs taken. 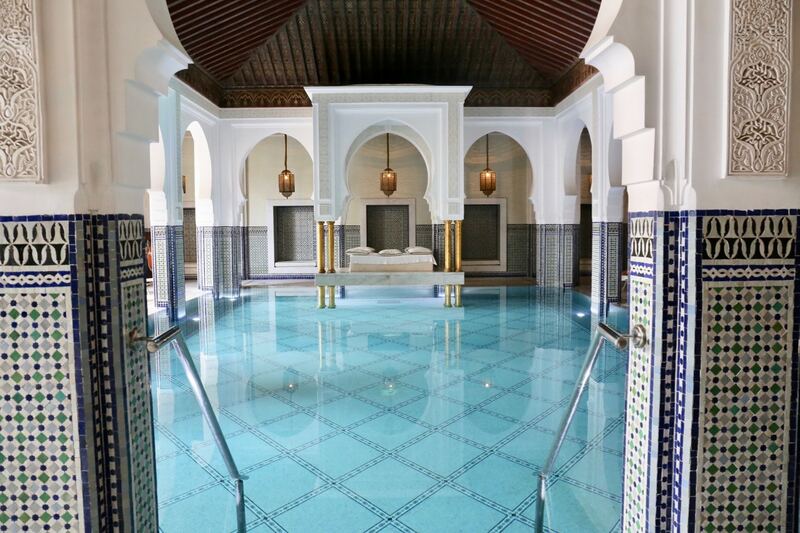 If you’re looking to indulge in a slice of R&R, La Mamounia’s award-winning spa offers a perfect retreat. Likely the most Instagrammed spot on the property, the Spa’s indoor pool features Moroccan inspired arches which exude a regal feel while guests make their way to comfortable loungers. The iconic 3m-high four-post marble bed seemingly “floating” over the edge of the pool is the perfect place to relax after a long day spent in the bustling souks of Marrakech. Craftsmen spent countless hours working on the impeccable details for each architectural element; the gebs stucco work on the pool’s columns was specially imported from Mesopotamia and represents the highest standard in Arabo-Andalusian art. This antique artwork, typically found in palaces and mosques, involves intricate patterns drawn by calligraphers to create one-of-a-kind art that is also visible in the hand-painted wood vaulted ceiling. 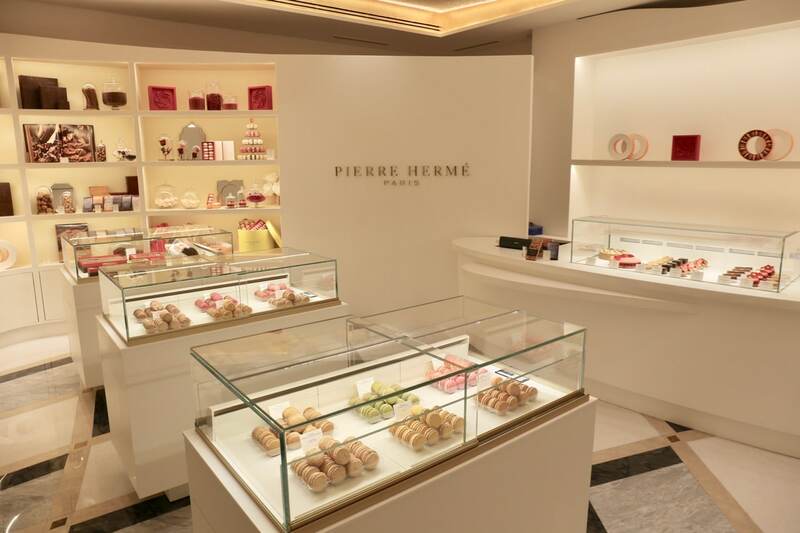 French pastry fans swoon for the hotel’s Pierre Hermé boutique, the first ever opened on the African continent. It’s a carefully thought out space where macaron lovers can indulge themselves in edible inspirations dreamed up by the best pastry chef in the world (2016’s Academy of World’s 50 Best Restaurants). 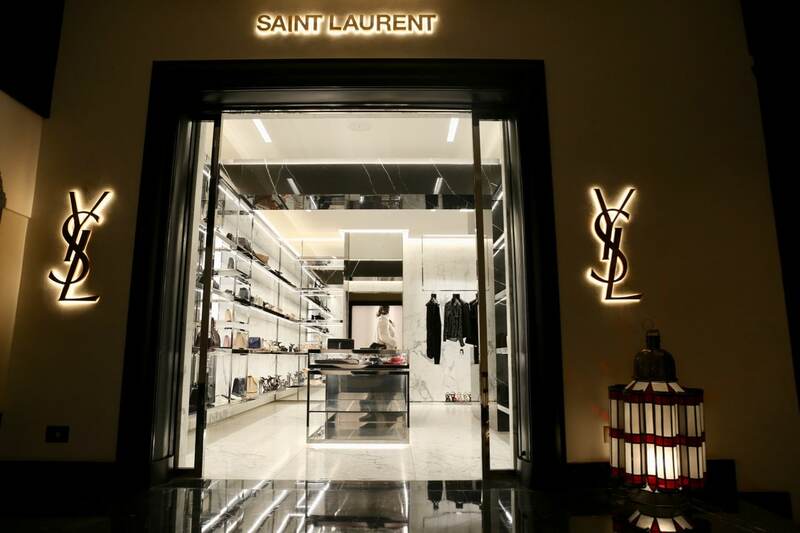 The hotel features several luxurious fashion boutiques featuring everything from expertly crafted contemporary Moroccan designs to French faves Yves Saint Laurent and Dior. The gardens of La Mamounia are nothing short of magical…Let the gardens work their magic as you wander around their 8 hectares, sit on a bench to listen to the birds chirp in peaceful calm while a refreshing breeze gently blows or grab a racket and play a game of tennis in the garden’s immaculately kept courts. 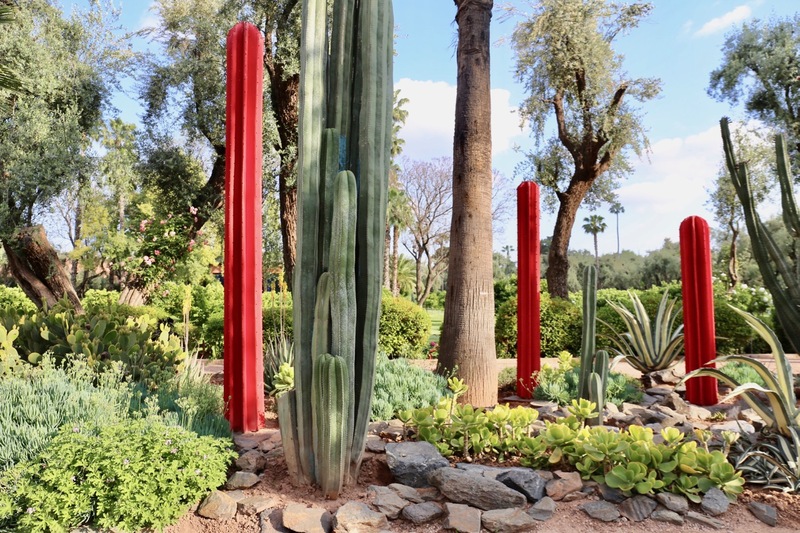 Within the park, the Menzeh Pavilion invites visitors to enjoy a quiet calm amongst the dozens of orange and lemon trees perfectly aligned against an arrangement of cacti. Beyond the Menzeh Flag sits a beautiful vegetable garden of 1,500 square meters where gardeners and chefs meet every day to pick and care for a parade of multi-coloured produce. Stroll through the hotel’s gardens and orchards and you’ll find 700 orange trees, 5,000 rose bushes, 21 cactus species, 6 palm trees species and 200 olive trees – impressive numbers, but together they combine to create a myriad of colours, fragrances, shapes and textures. You’ll also find lemon trees, jacarandas, bougainvillea, amaranth, agaves, and prickly pears. 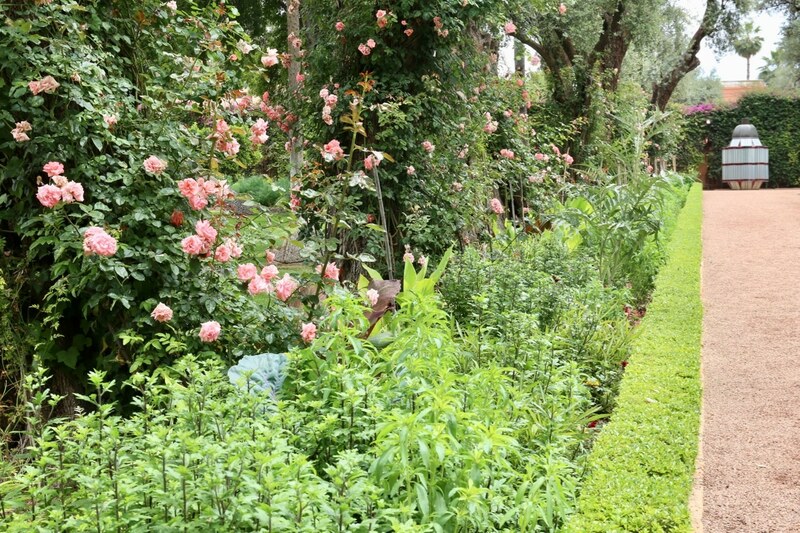 The gardens of La Mamounia are unique and wonderfully natural, crafted by the hands of passionate gardeners for almost a century. 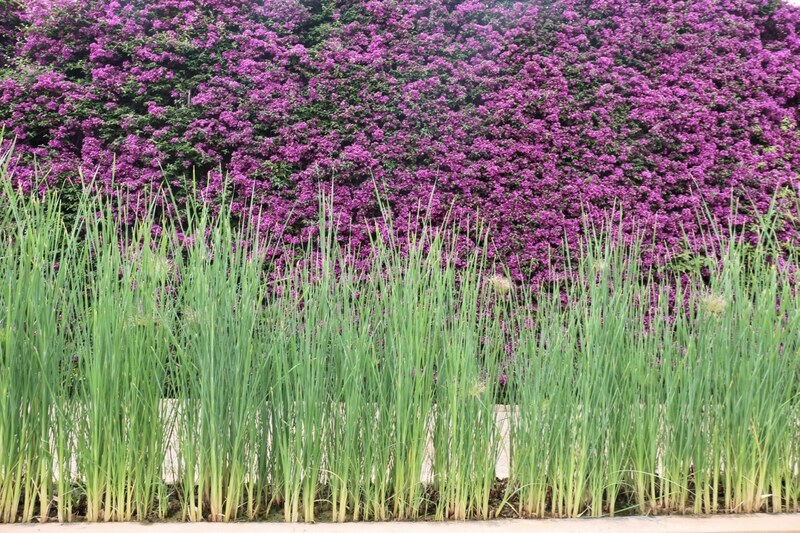 The garden’s most impressive feature is the massive purple wall which thousands of people capture each day via smiling selfie. You’ll also find lush reeds slowly tossing in the wind and friendly turtles who play in a nearby lily pad pond. From the garden, guests re-enter the hotel via L’Italian’s terrace, one of La Mamounia’s most coveted spots to sip and nibble in the sun. 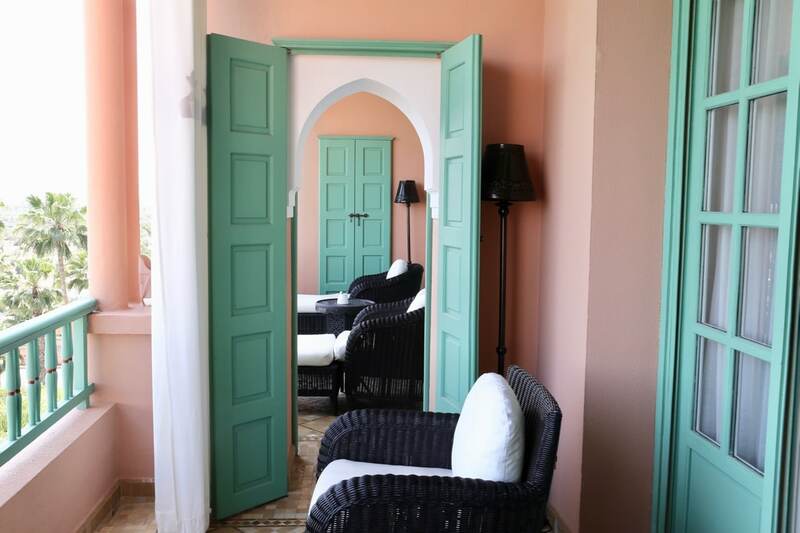 The hotel’s “living room,” is the high ceilinged La Majorelle Gallery which spills out onto a terrace overlooking the gardens. 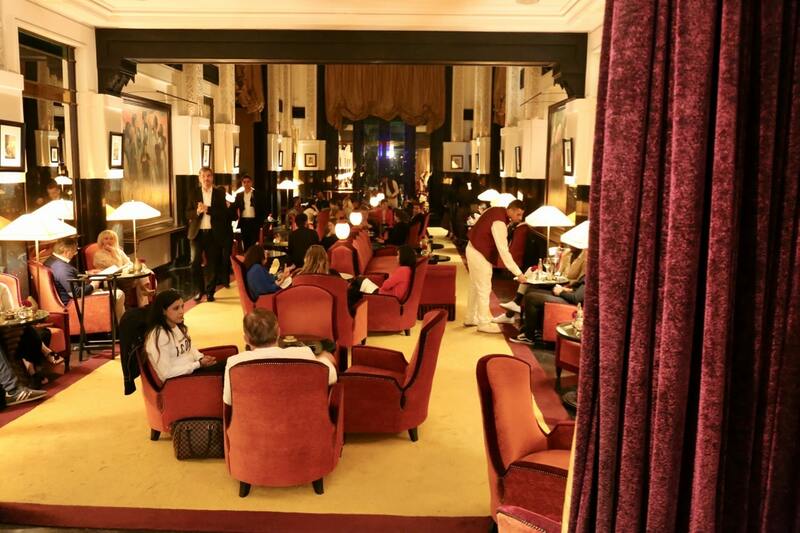 Enjoy an aperitif at the Italian Bar located beside La Majorelle Gallery. Warm and romantic, L’Italien offers a contemporary take on Italian cuisine, always prepared with fresh seasonal products from La Mamounia’s vegetable patch and selected producers. 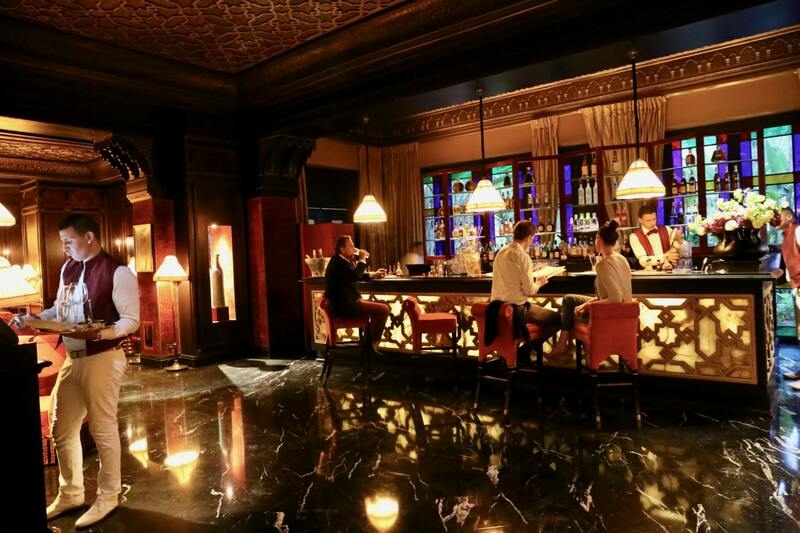 Its baroque style, dark purple tones and beautifully lit terrace offer an undoubtedly classy and intimate atmosphere. Le Pavilion de la Piscine is built around the hotel’s al fresco pool. Its sparkling waters (with a magical Murano glass bottom) and exquisite dimensions make this a beautiful oasis, surrounded by lush vegetation. 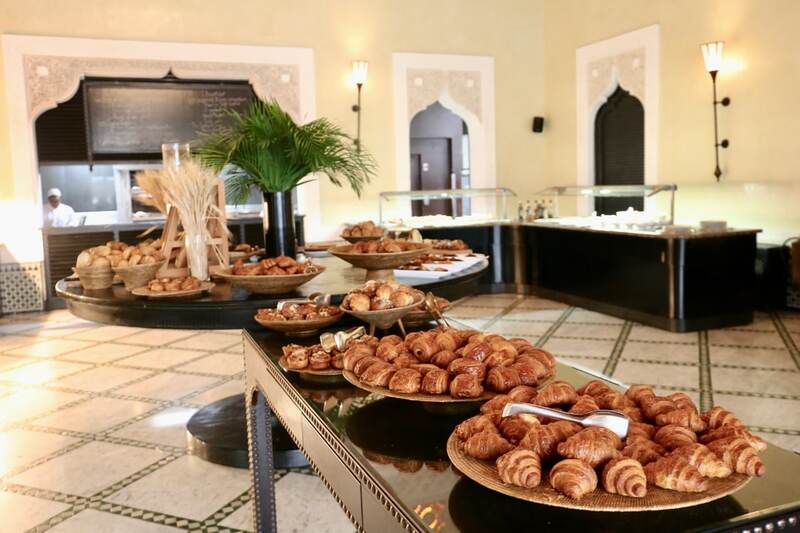 Wake up to the world to a superb brunch buffet by the water’s edge.